Coconut flour is an amazing gluten-free flour you should get to know. In just two tablespoons there are 6 grams of fiber and 2 grams of protein. It is a great addition to smoothies or anything that needs a nutritional boost. Coconut flour can be found in health food stores or well stocked grocery stores. 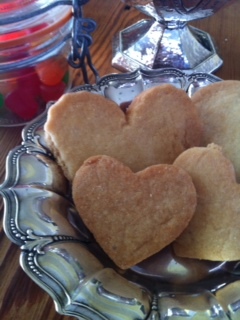 This recipe is for drop cookies – easier than rolling and cutting, but my young friend who gave these sugar cookies to me last night, went to the bother, so beautiful. this recipe produces a not too sweet, cake-like textured cookie, if you like your cookies with a bit more chew, try the following recipe – not to mention these have a big ginger flavor. This entry was posted in Recipes and tagged Coconut Flour, cookies, dessert, Ginger, Gluten-Free, Oatmeal, Wheat-free. Bookmark the permalink.